For advice about clearing snow and ice and to find out where your nearest salt bin is visit www.wandsworth.gov.uk/snow. There are 20 salt bins at strategic places around the borough for people who choose to clear ice and snow from footpaths in front of their homes. 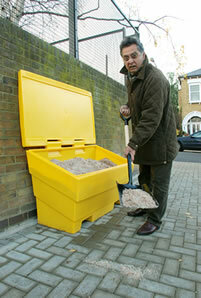 Each bin contains one tonne of salt – and these will be refilled regularly when the weather demands it. Neighbourhood watch co-ordinators are also being offered 50 kilos of salt each for use in their streets, while supplies are also available for churches and other community organisations. “Last year’s snow and ice was the worst for 35 years. Yet many local people felt powerless to clear their own pavements and footpaths because of worries over health and safety rules and the fear of being sued. “We are positively encouraging people to take action if they feel they can, and to do the same for neighbours if they live next door to someone who is elderly or disabled. There's no law stopping you from clearing snow and ice on the pavement outside your home, and it’s inconceivable that you would be sued or held legally responsible if you have cleared it carefully. The Government has also issued guidance to households on clearing snow and ice from pavements. Visit www.direct.gov.uk/en/Nl1/Newsroom/DG_191868 for more information.